PipeSMOKE 09/97 – Picking the Perfect Pipe (pg.2). Pipes: Logos & Estampilles – Logos & Markings. 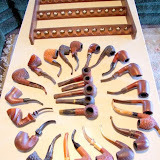 Tobacco Pipes, Smoking Pipes, Estate Pipes & Pipe Tobacco at Smoking Pipes .com. Saving this site for a point of reference about pipes. A reference for pipe shapes with pictures and descriptions. Great reference site.